The Offaly native was forced to battle all afternoon before finishing on a high. Shane Lowry during day two of the BMW PGA Championship at the Wentworth Club. THE EUROPEAN PGA is developing into a two-horse race, at Wentworth, as Shane Lowry and Thomas Bjorn lead the field by four strokes. Bjorn went around in level par today while Lowry recovered from a double bogey on nine to shoot a 70 and join the Dane on -10. The Offaly native parred his first six holes before dropping a shot on seven. He immediately claimed that stroke back before his double bogey scorecard blot. Lowry’s response was excellent, however, as he birdied two of the next three holes. His progress was serene thereafter and the birdie, birdie finish gives Bjorn, who could not match his opening 62, company overnight. He may have missed the cut but European Ryder Cup captain Paul McGinley [+5] will be pleased with the form of a group of players he hopes to select at Gleneagles. While Bjorn and Lowry may be outside bets, Henrik Stenson [-5], Rory McIlroy [-5] and Luke Donald [-5] should all form part of the Dubliner’s team. McIlroy handed three shots back to the tricky Wentworth course over the opening seven holes. For the second round running, he eagled 12 and finished with three birdies over the last four holes to sign off for a round of 71. Pádraig Harrington fell back down the leaderboard today as his 76 saw him finish on +1. Simon Thornton carded 68 to climb to -2. Damien McGrane finished on +2 and should make the cut. Email “Birdie, birdie finish catapults Shane Lowry into European PGA lead”. 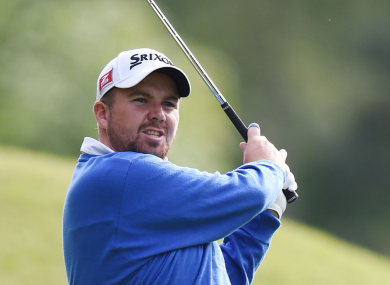 Feedback on “Birdie, birdie finish catapults Shane Lowry into European PGA lead”.